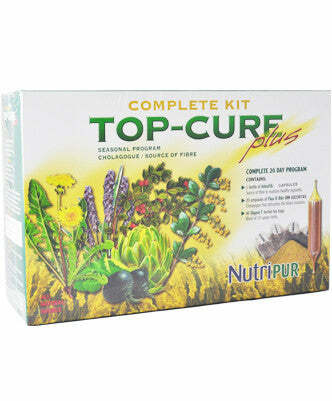 Kit Top-Cure Plus contains three formulas that work gently and naturally to help eliminate toxin build-up from the body. A complete 3 in 1 herbal cleansing 20 day program that helps detoxify the liver, the colon and the kidneys. Can also be used as a seasonal program, at the change of seasons, prior to starting a weight loss program or before planning a pregnancy. Is a unique and delightful blend of 15 expressly herbs, chosen for their therapeutic benefits. Is the perfect complement to reinforce, all day long, the beneficial digestive effects of Flux-O-Bile. Contains organic ingredients. Gluten Free. Suitable for vegetarians. Black Radish Root: Black radish root contains glucosinolates. These active components improve gastric disorders, especially those related to biliary functions. Boldo Leaf: Boldo stimulates the secretion and elimination of bile, allowing for better digestion. It’s also recognized to calm gastrointestinal spasms. Boldo has a long history of use as a liver tonic by the indigenous people of Chile. Artichoke leaf :With its content in cynarin and bitter principles, the artichoke is a precious aid to help eliminate digestive and hepatic disorders. Used as an aid in lowering cholesterol. Dandelion root : With its inulin content and bitter substances, dandelion is a very effective liver detoxifying and strengthening herb. Well recognized for its diuretic effect. Dandelion also helps relieve digestive discomforts and dermatological conditions. Psyllium: Its exceptional richness in mucilaginous psyllium fibre confers it properties that relieve constipation by reducing the total duration of the intestinal transit. Furthermore, psyllium (plantago ovata) is now recognized to help reduce slightly elevated cholesterol blood levels as well as relieve diverticulosis and irritable bowel syndrome. Licorice: Recognized as an anti-inflammatory, Licorice effectively relieves the irritated mucous membranes of the gastrointestinal tract. Its antibacterial properties confers it the capacity to fight against certain intestinal pathogens. Red Elm: The mucilage content of Red Elm protects and relieves irritated intestinal mucous membranes. It also aids in preventing diarrhea. Furthermore, Red Elm is recognized to calm multiple inflammations of the digestive tract, in particular the ones affecting the intestines (ex. : colitis). Hibiscus: Abundantly cultivated in tropical regions and in Europe, the Hibiscus flower is recognized for its virtues as a mild laxative for the intestines. Star anise: Calm spasms of the digestive system. Marshmallow : Soothes multiple inflammations of the gastrointestinal tract. Rhubarb : Increases intestinal motility and restores regularity. Bearberry : Combats infections of the lower urinary tract. Cherry : Known as an excellent diuretic. Cough-grass : Diuretic, reduces urinary tract inflammation. Barberry : Relieves discomforts caused by indigestion. Juniper : Corrects and reduces flatulence and bloating. Spearmint : Reduces flatulence and spasms of the digestive system. Red clover : Alleviates cramps and spasms. Balm : Relieves digestive disorders of nervous origin and digestive migraines. Fennel : Reduces cramp-like gastrointestinal disorders, bloating and flatulence. Flux O Bile: Cleanses the liver, eliminates accumulated toxins, promotes better digestion and stimulates biliary function. IntesFib: Gently maintains regularity, cleanses the colon, helps reduce cholesterol levels and promotes a better absorption of vitamins and minerals. Digest-T: Improves sluggish digestion and stimulates intestinal and renal elimination. Signs of intoxication (fatigue, runny nose, skin problems,...). Do not use if you are pregnant or breastfeeding. Consult a health care practitioner prior to use if you have liver or gallbladder disease, and/or intestinal obstruction. Verify further contraindications in the packaging. FLUX-O-BILE: Adults: Take one ampoule in the morning before breakfast in half a glass (125-ml) of lukewarm water or juice and preferably a minimum of 30 minutes before breakfast. Continue for a minimum of 20 days. INTESFIB Adults: Take 3 capsules twice a day, with water or juice, in the morning before breakfast (minimum of 30 minutes after Flux O-Bile) and at bedtime or as directed by a health care practitioner. Follow with an additional glass of liquid. Take 2 hours before or after taking other medications. Laxative effect observed 12-24 hours after first dose, and may take 2-3 days. DIGEST-T: Adults: Let 1 tea bag steep for 3 to 5 minutes in a cup of boiling water. Drink 2 to 4 cups per day, preferably after meals and in the evening. Continue for a minimum of 20 days.